Fiona is a textile artist who loves combining mediums and techniques to create her own textile, jewellery and sculptural pieces – usually with a contemporary feel. She has loved making jewellery since the early ‘80s when she made jewellery for a living. 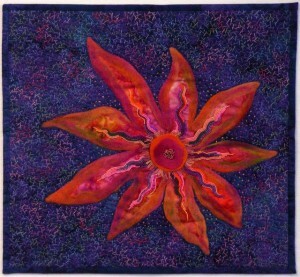 In more recent years she has found that quilting and other textile-related arts – particularly beading onto fabric – fulfil her lifelong love of fabric. Since 2013 coiled basketry techniques have featured more and more in her creative output, including jewellery, vessels, wall pieces and sculptural forms. She works mainly with colourful tapestry wool due to the wide range of colour options it affords, but she sometimes works with the more traditional basketry materials such as raffia. Teaching has been a part of Fiona’s life for many years, including primary school teaching, teaching English in Japan, and teaching Diploma of Aromatherapy courses. In recent years her workshops have allowed her to combine her passion for teaching with her love of creative arts, particularly textiles and jewellery. She holds a Diploma of Teaching and Certificate IV in Assessment and Workplace Training. 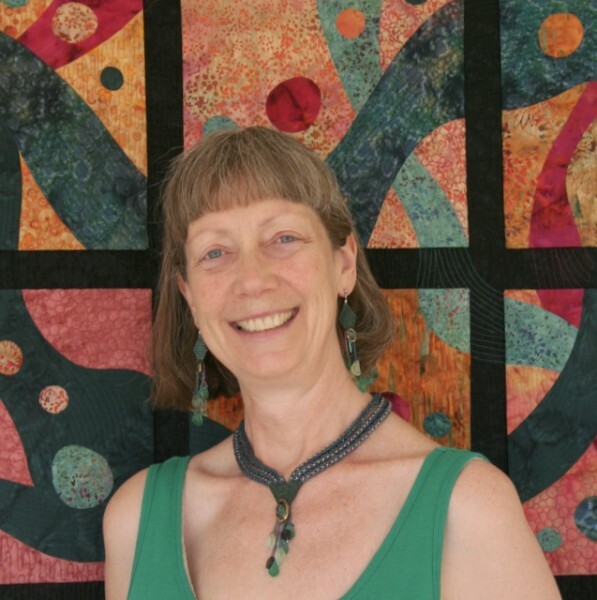 Fiona’s quilts, beadwork and textile art creations have appeared in several Australian quilting, textile art and beading magazines. Her work has also been seen in exhibitions, and has won numerous awards and prizes. 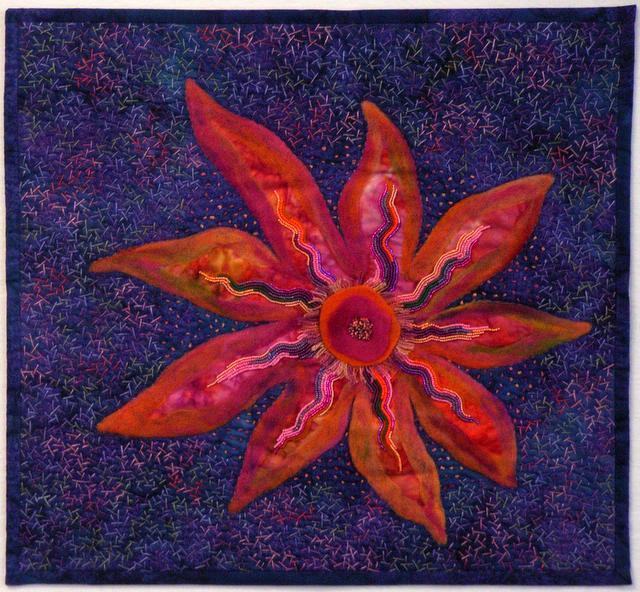 In 2008 her small bead-embellished quilt “Botanical Oddity” was awarded the Down Under Quilts Best Use of Colour prize at the annual Canberra Quilters exhibition. 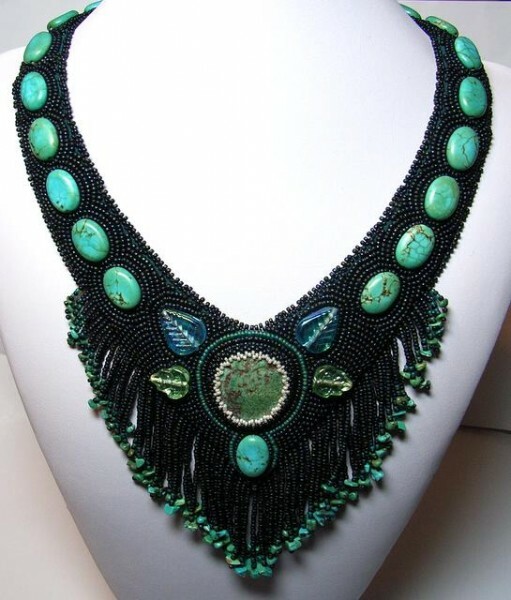 In 2009 Fiona’s beaded neckpiece, “Turquoise Treasure”, received the highest accolade at the Royal Canberra Show’s Arts and Crafts exhibition – it was judged the Grand Champion Craft Exhibit. 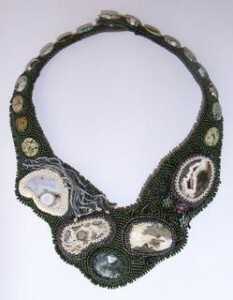 That same year, her beaded neckpiece “Nature’s Treasures” won joint first place in the 3D category of the Goulburn Art Award. The prize for this was an exhibition – along with the other art award winners – at the Goulburn Regional Art Gallery in NSW, Australia in December 2010. 2015 was a special year for Fiona as she was invited to be a Guest Artist at several of the Stitches and Craft Shows around the country. She was requested to focus on her beadwork for her display, so she put together a fulsome selection of beaded creations, from jewellery (both off-loom beadwork and beaded textile items) to wall quilts and even some sculptural forms and small coiled basketry items. She also offered mini make-and-take classes at her stand, which were a great success. These photos show Fiona’s Guest Artist stand at the Newcastle Stitches and craft Show in 2015. Fiona travels around Australia teaching her workshops to groups, guilds, retreats, shops and symposiums. 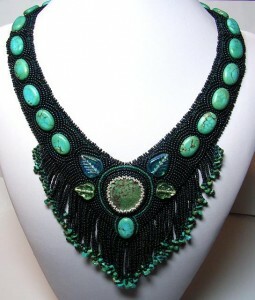 She also offers private lessons in many kinds of beadwork at her home in rural NSW. She is an enthusiastic teacher who loves to encourage her students to try new things and let their creativity flow.